Set of four dining chairs with slip seat and back, each detailed with Taliesin carved edge and carved back. Mahogany. 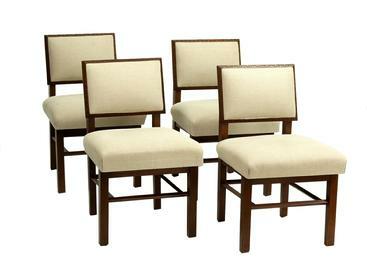 This is a very nice set of four Taliesin Collection dining side chairs. Well cared for. Carving details are strong and sharp with minor signs of use. Foam is strong and soft, probably reupholstered. Very minor discolorations to chair seats. Fabric color is best represented in our photos 1 - 3.